Mendenhall Glacier lies just 12 miles from downtown Juneau, Alaska, which explains its popularity. Visitors can walk to Mendenhall Lake at the foot of the glacier via the wheelchair-accessible Photo Point Trail. Several other trails offer opportunities to view the glacier and the wildlife of Alaska's Tongass National Forest. During peak season, which is May through September, admission to the glacier viewing area and all trails except the Photo Point Trail is free, but the Visitor Center charges a $5 admission fee for visitors ages 16 and older. This fee gives you access to the Visitor Center, Photo Point Trail and all on-site restrooms. If you have an Federal Recreation Lands Senior pass, you will not need to pay the fee. Mendenhall Glacier's Visitor Center features enormous windows that offer a panoramic view of the glacier. Visitors can watch an audio-visual presentation, look at exhibits and learn about the Juneau Icefield. The Visitor Center is open year-round, although winter hours are limited. US Forest Service rangers and guest speakers offer special programs all year long. While many people go to Mendenhall Glacier with a tour group or on a shore excursion, you can also get to the glacier on your own. You can take a taxi from Juneau, drive to the glacier with a rental car or take the city bus to Glacier Spur Road and walk the rest of the way (1.5 miles). There are also two private tour companies that offer shuttle bus service between Juneau's cruise dock and the glacier, M&M Tours of Juneau and Juneau Tours. The wheelchair-accessible Photo Point Trail is 0.3 miles long. The trail is paved and easy to navigate. Best of all, it offers a marvelous view of Mendenhall Lake, Mendenhall Glacier and Nugget Falls. If you visit between the first of May and the end of September, you will need to pay the $5 admission fee in order to walk along the Photo Point Trail. Nugget Falls, at the end of Nugget Creek, flows into Mendenhall Lake. The trail to Nugget Falls branches off from Mendenhall Glacier's Photo Point Trail and takes you to the foot of the waterfall. The two-mile trail trail is very flat and is mostly unpaved. You can walk right up to the waterfall when you reach the end of the trail. It will take you about one hour to walk the Nugget Falls Trail. Other trails at Mendenhall Glacier include the one mile Trail of Time, the 1/4 mile Steep Creek Loop and the 3.5 mile East Glacier Loop. The Mendenhall Glacier trails are open daily from 6:00 a. m. to midnight, even when the Visitor Center is closed. If you plan to walk or hike during your visit, dress appropriately and wear hiking boots or other shoes with soles designed for wet and slippery surfaces. Bring food and water if you are taking a long hike. The Mendenhall Glacier Visitor Center is open from 8:00 a. m. to 7:30 p. m. from May through October. The Visitor Center is also open from October through March, but hours are much more limited and local weather conditions may cause the Visitor Center to close earlier or open later than posted times. The Visitor Center is usually closed during the month of April; check the park website for up-to-date information. What Is a Glacier, Anyway? A glacier forms when the snow pack does not entirely melt away, but is instead compressed by additional snow accumulation. Eventually, the compressed snow becomes ice. The force of gravity pulls the glacier downhill. A glacier is said to be retreating when it no longer moves forward and downhill because it is melting faster than new snow and ice can accumulate. As a glacier moves, it scrapes away soil and rock. 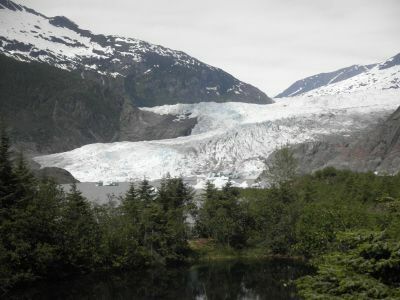 The glacier deposits rocks and soil at its terminus, which, in Mendenhall Glacier's case, is Mendenhall Lake. You may notice that some lakes and rivers in Alaska appear cloudy. This is due to the finely-ground, powdery soil that glaciers create. This powder flows into lakes and rivers along with the water that melts from the glacier. Juneau is bear country. Never leave food or discarded wrappers on a trail or in a parking lot. Locals will tell you to carry "bear mace" to repel bears. You can also wear "bear bells," which make noise to warn bears of your approach, when you're on the trail. If you do see a bear, back slowly away, yelling and making noise. Don't try to get closer - no photograph is worth a mauling - and don't turn and run, as the bear may decide you are prey.